Why settle for anything but the best lighting? I took this - mounted atop a miniature tripod like some kind of blogger magic wand - to a meet earlier this year as I hate when potentially gorgeous shots are spoilt by artificial yellow light. It saves a lot of time editing them afterwards too! Needless to say the other bloggers were blown away with it. With the constant buzz of social media and... more social media. Your phone's battery is probably one of the most complained about first world problems. 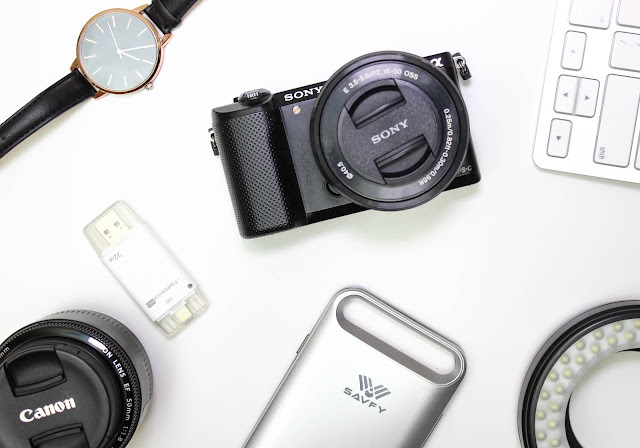 Whilst I don't go anywhere outside a 20 mile radius without my external battery - complete with enough USBs to charge all my devices on the go - it's nice to opt for a lighter option like this iPhone Battery case by Savfy. Which adds a little extra bulk and a whole lot of peace of mind. This is not just your typical USB stick. As much as I hate running out of battery on my phone, I hate running out of space more. This little gadget allows me to quickly save those memories whilst I'm out and about and effectively doubles my phone's memory. Which means it is a must have if you're frequently vlogging on your phone or are snap-happy like me. It also allows for the transfer of blog photos to your tablet for editing with a range of apps like Lightroom for iOS which is incredibly handy if you're travelling a lot. Let me know what you use in the comments below - and if you've be interested in delving a little deepr into by blogging kit! To read more posts in my #BloggingHacks series, click here.